The American Chemical Society has agreed to offer the member registration rate to all IUPAC 2014 delegates. Current ACS member registration rates are $380 early bird and $445 standard. Create an ACS ID and password – ACS membership is not required. If you have submitted an abstract for a presentation at the Congress, you can use the same ACS ID. If you don’t have an ACS ID, here is the link to create one: ACS ID. The form asks for an ACS Member ID, but this is not a required field. Enter your ACS ID and password. Then, in the very first field, which is labeled Voucher, enter the code IUPAC14. Even if you are an ACS member, please enter the code so that you are identified as an IUPAC Congress Delegate and will receive notifications to sign up for IUPAC 2014 social events. During the on-line registration process, there will be a large list of events related to the ACS Meeting. Be sure to look for the IUPAC-sponsored events: the Gala Congress Banquet ($50.00 per person); Post Congress Agricultural Field Tour and Luncheon ($85 per person); and select from the many daily luncheon seminars (one free seminar per attendee). Open the email confirmation you received from ACS after you registered. The sender is “eventconfirmation@xpressreg.net”. 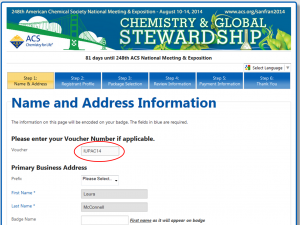 The subject line will read: Registration Confirmation – 248th ACS National Meeting & Exposition. Near the top of the email you will see: Click here for your receipt. Your browser should open (you might have to log-in using your ACS ID log-in) and follow the instructions under the big blue arrow button. Download these instructions as a printable file. If you don’t see the IUPAC social events listed, you may have accidentally registered without using the IUPAC14 code. Please email either Ken Racke or Laura McConnell to have your registration changed to IUPAC. • Mail: ACS Registration Services c/o Convention Data Services (CDS),107 Waterhouse Road, Bourne MA 02532. Please sign up for email updates to receive the latest information on registration.